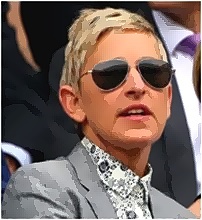 Ellen DeGeneres responded after being accused of racism when a photoshopped meme of herself and Olympic sprinter Usain Bolt had surfaced. The television show host was highly aware of the racism that exists in the country. She added that it was the furthest thing from who she was. Usain has not react to the meme but he became the first person to claim the gold medal in the event for the third consecutive time. Meanwhile, the controversy built overnight after many Twitter users quickly suggested that there were more negative impressions of showing a white woman riding a black man as a form of transportation.